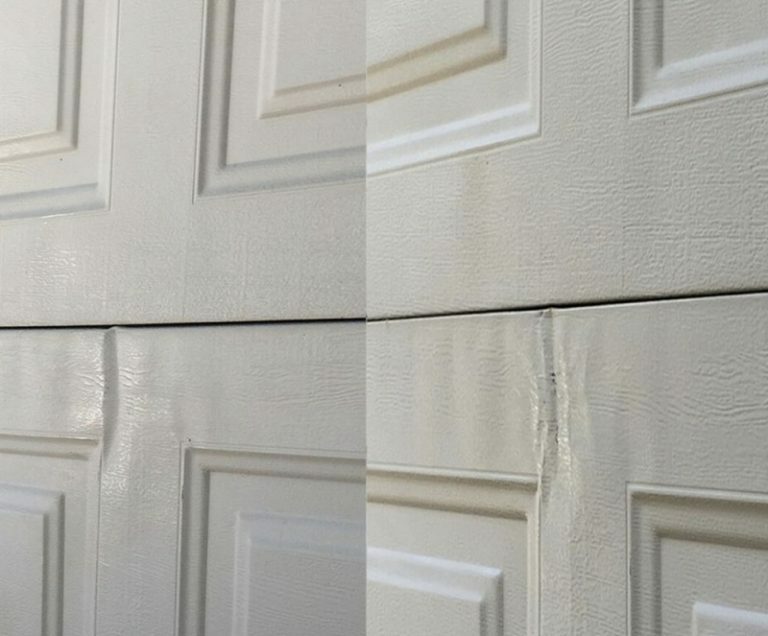 Dents can be unsightly and can even cause your HOA to notify you to replace your door. Those hail sized dents from a the neighborhood kids soccer ball or that time you gave the door a love tap with your vehicle. Unfortunately small dents and aesthetic damage is rarely able to be fixed. Garage doors are made of very thin steel with a pressed wood grain appearance. Once the steel is stretched there really isn’t anything that can be done except replace a panel which is very rare unless your door was installed in the last 5 years. That then constitutes an entire door replacement. So, be nice to your garage door but, if an accident occurs. We’ve all been there. Sometimes you’re in a rush backing out of the garage and accidentally give your garage door a “love tap” with your car. Or, maybe you were playing basketball in the driveway and missed the shot. Unfortunately, these common accidents can lead to dented garage panels that create more serious consequences if not repaired. Although typically maintenance- free, garage doors are made of thin steel with a pressed wood appearance and will dent easily. These dents can be aesthetically unpleasing and will decrease your overall curb appeal. While a small dent may not be a huge deal at first, damaged doors can affect other door features such as opening and closing correctly. 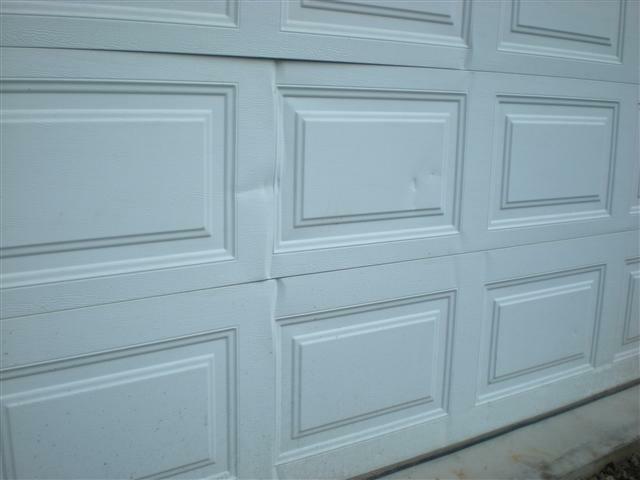 Most importantly, damaged garage panels place your home’s safety and security in risk. Large dents will need replacement, especially if more components than just the panel were affected. Once the metal is stretched and damaged, you have two repair options. If your door was installed in the past five years, repairs could be as simple as replacing the panel at a lower cost. With older garage door models, you will need to replace the entire door. Although smaller dents can be repaired using common household items, damage doesn’t always respond well to home remedies and can cause more issues down the line. The important this is not to panic and assess your repair options. This is where the professionals come in. 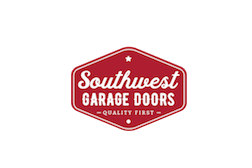 We recommend always calling Southwest Garage Doors after garage panel damage for a professional assessment and honest quote. As a family-owned business with the most experienced technicians, we understand the importance of ensuring both garage door appeal and safety. We take pride in supplying our customers with quality work and treat every dent, scratch, and breakage as we would our own. 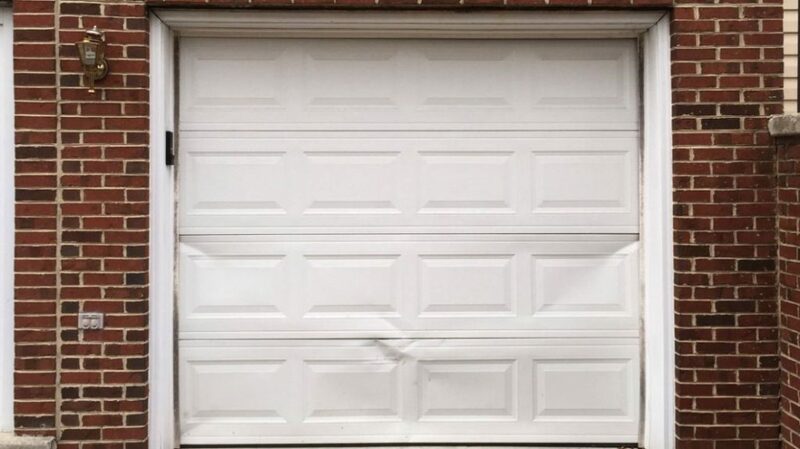 If you currently have a damaged garage door panel, set up an appointment today to learn your repair solutions.